Social Communications has been appointed by Bradford Council to support the campaign for a Northern Powerhouse Rail station to be sited in the city centre. Social Communications' Arnie Craven, Victoria Starkey, Pete Wrathmell and Gerald Jennings. The agency's Leeds office is delivering public affairs, PR and creative support for Next Stop Bradford, a campaign to secure major transport investment in the city. Last month, the agency’s PR team supported the official campaign launch with a media photo call with senior local politicians and regional business leaders which gained television coverage on BBC Look North as well as other local, regional, business and trade media. The campaign has already secured national attention, being referenced by Paul Maynard MP, the Rail Minister, in a House of Commons debate on 30th March. The new account is led by Group Director Pete Wrathmell and Leeds Chairman, Gerald Jennings. Wrathmell said: “This is a significant win for our agency and a great opportunity for our Yorkshire-based team to draw upon our skills across PR, public affairs and creative. 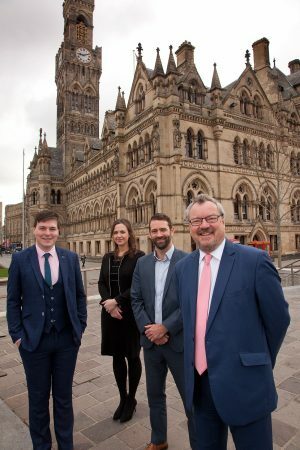 With Northern Powerhouse Rail having the potential to deliver significant benefits for the regional economy and act as a catalyst for further investment in the district, there is widespread energy and commitment from across the region for the campaign. A website for Next Stop Bradford is being developed and will be launched at an event in Leeds on 27th April. Social media support will be rolled out with a #nextstopbradford Twitter campaign. Julian Jackson, Assistant Director of Planning, Regeneration and Highways at Bradford Council, added: “The Northern Powerhouse Rail campaign is a key priority for Bradford Council. It is vital we demonstrate to the Government and Transport for the North that Bradford must secure a city centre station to ensure the opportunities of the Northern Powerhouse are fully exploited.